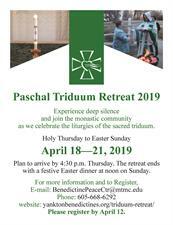 Paschal Triduum Retreat: Enter the silence and experience the rich liturgies of Holy Week with the monastic community of the Benedictine Sisters of Sacred Heart Monastery in Yankton. This retreat begins 4:30 p.m. April 18, Holy Thursday, and ends with noon dinners on Easter Sunday, April 21. For more information go to the web page, www.yanktonbeneditines.org/triduum-retreat/. To register, e-mail BenedictinePeaceCtr@mtmc.edu or call 605-668-6292 before April 12. A personal retreat may be arranged at another time that better fits your schedule.